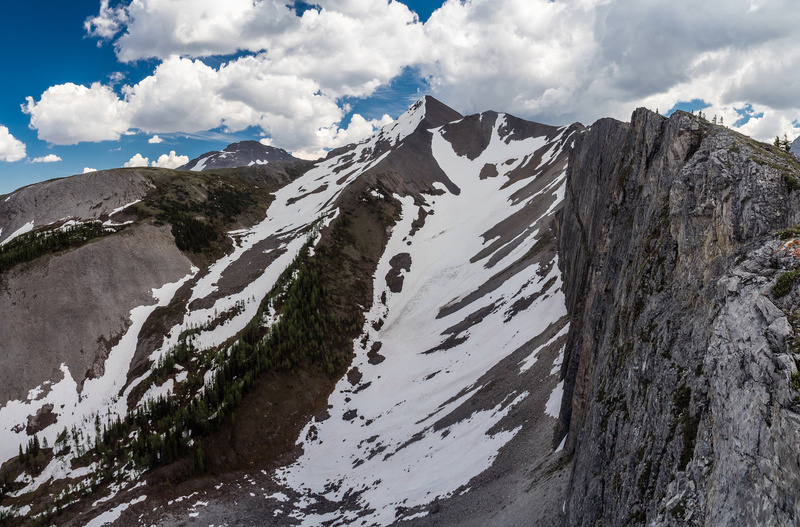 Difficulty Notes: The traverse from Mount Morrison is moderate scrambling with exposure, but if ascending via Owl Lake and Ridge this is an easy scramble. 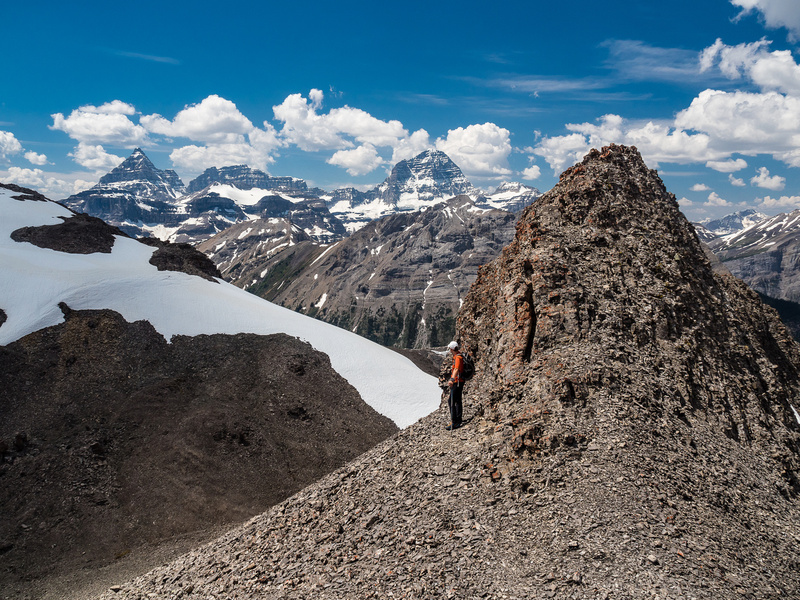 After being only the 6th summit party in the last 31 years to stand on Mount Morrison’s summit, Phil and I somewhat reluctantly turned our attention to our next destination – Owl Peak. We were only reluctant because we didn’t see how the day could get any better than it had already been! The weather had been perfect to this point, our route had worked out beautifully and the views were overheating our cameras. How could it get better? We set out to find out. 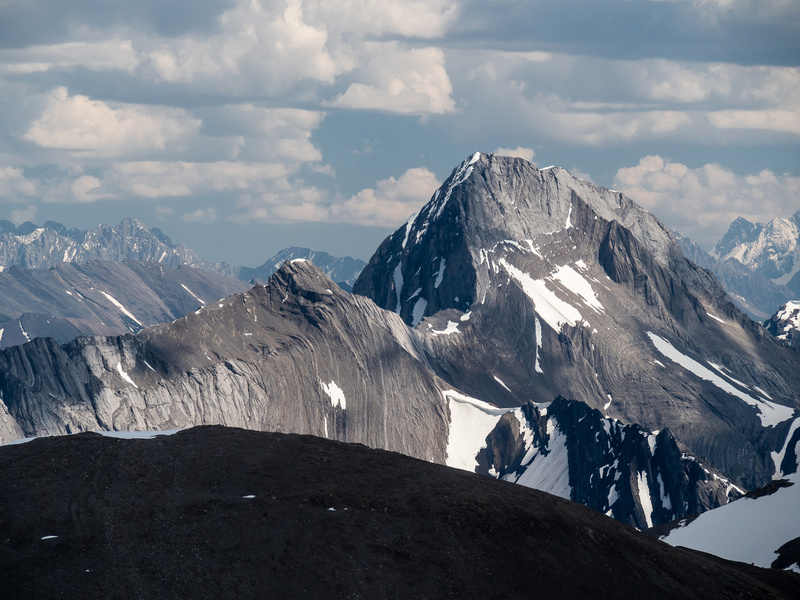 Right away we encountered a pretty exposed north ridge from the summit of Morrison. Rather than mess with the exposure, we decided to try the west facing slabs and scree instead. This worked, but was a bit tricky in spots. After circumventing the ridge just under the summit, we traversed back to it and decided to stick on it wherever possible from that point forward. 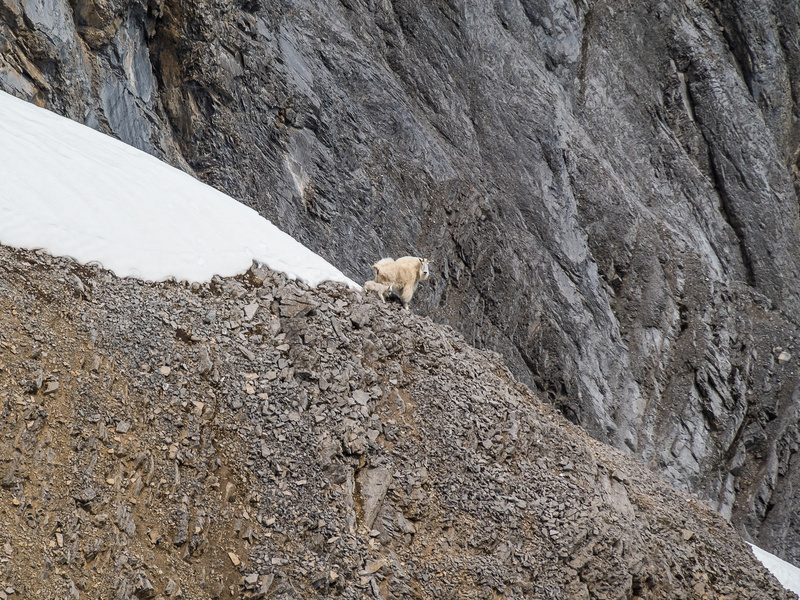 A highlight on the upper north ridge of Morrison was spotting the mountain goat with a baby kid, scampering down some extreme terrain on the east face. Staying on the ridge worked out perfectly. In a theme for the day, every time we thought for sure we’d be cliffed out, the ridge route would open up and remain straightforward. 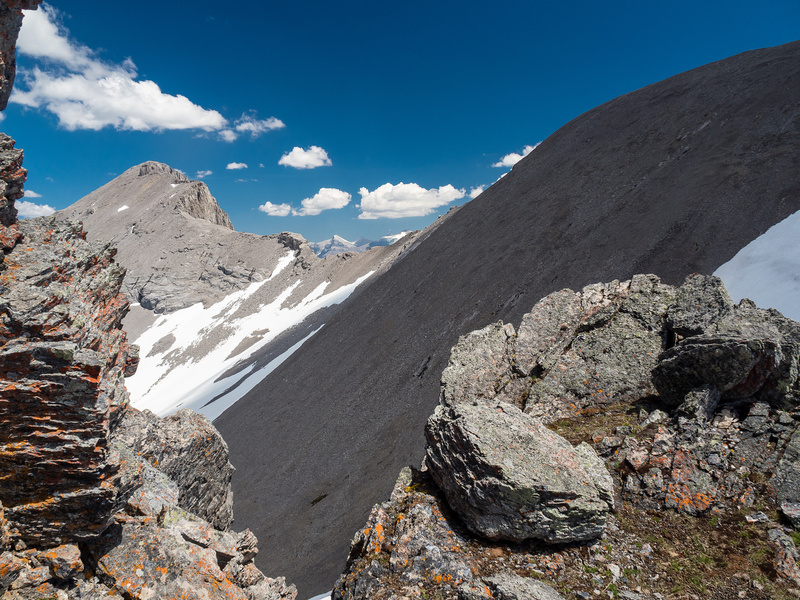 As we made our way over the intervening bumps between Morrison and Owl, we continued to marvel at the scenes all around us – this high level traverse we quickly becoming a summer highlight. 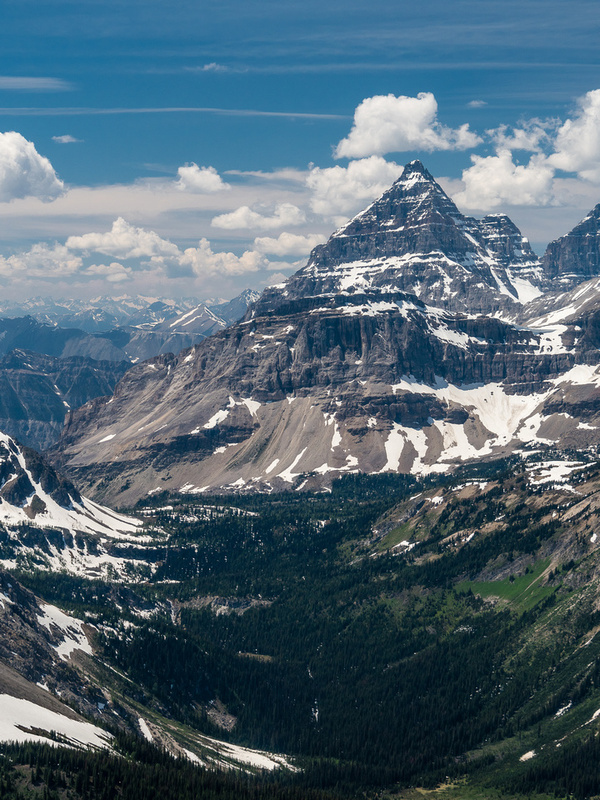 Mount Eon and Assiniboine obviously stole the show, but there were many others competing vigorously. 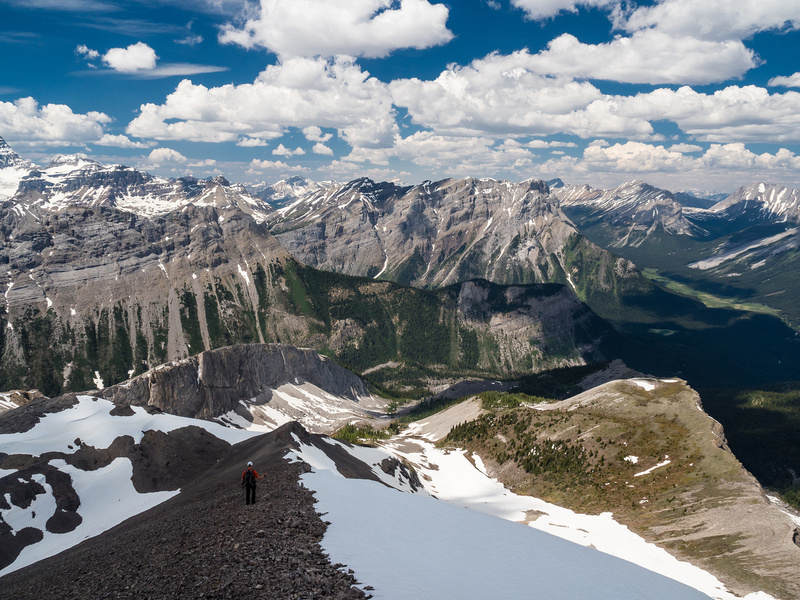 Looking back at the summit of Morrison – the ridge is pretty intimidating! 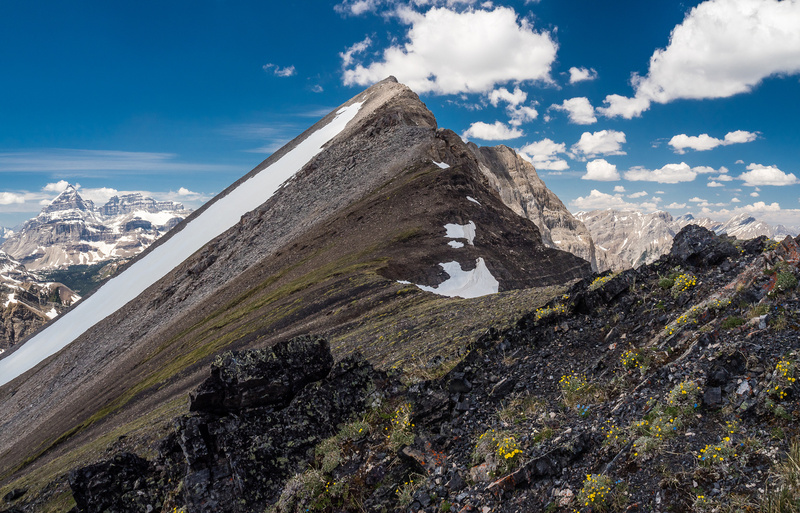 Looking back along our traverse from Morrison with now-familiar views of the Spray Lakes and Burstall Pass peaks completing the panorama. Some surprising exposure on the traverse. 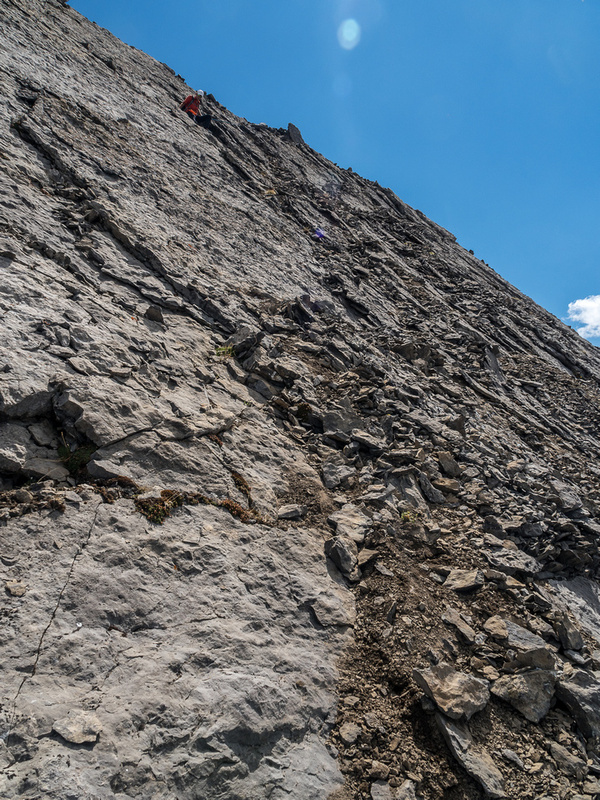 The options were exposure or steep slabs with scree to our left. As we continued traversing towards the east ridge of Owl Peak, a crux gully up the nose of the ridge appeared to get more and more difficult just up from the col. We had spotted this crux already early in the day from Morrison’s lower west face, but at several points throughout the day it started looking less and less intimidating. Now that we were facing it directly, it looked scary again but we decided to “get our noses into it” before making any evasive maneuvers. Once again our day proved on point, the crux was moderate and fun rather than scary. We ascended it to a large chockstone before deviating around on climber’s left and ascending back onto the ridge proper above it again. From above the crux to the summit we enjoyed yet another “walk in the sky” in perfect conditions. At some point we both remarked that we kept taking photos of the same scene since it was so beautiful! Owl Peak finally looks like a proper mountain! The crux is starting to look like a ‘crux’ too, but it proved much easier than it appears. 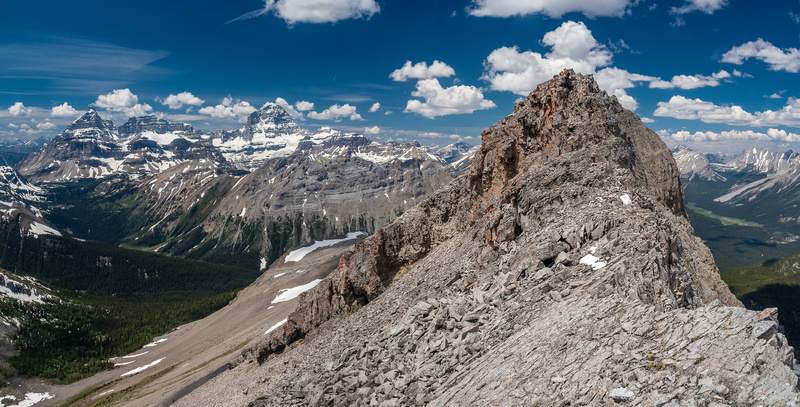 An easy scramble along the ridge just before the summit. Nice easy rambling along the summit ridge with clouds slowly building but only adding to the views. Another gorgeous walk in the sky. Byng on the left and Turner on the right. 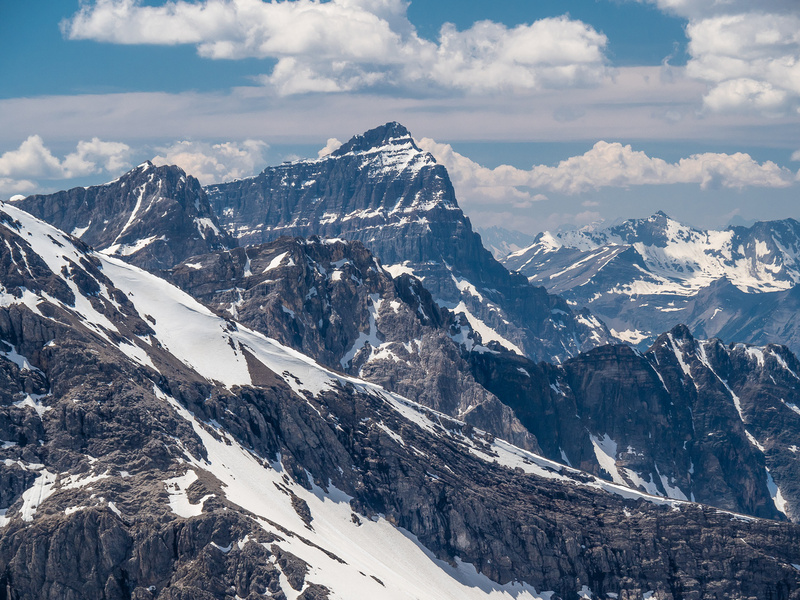 The summit of Owl Peak was just as enjoyable as Morrison’s, with slightly better views towards Marvel Pass and the Assiniboine Park regions and slightly worse views towards the Spray Lakes and Burstall Pass areas. We spent another 30 minutes or so chilling, re-hydrating and building a summit cairn since none was present. 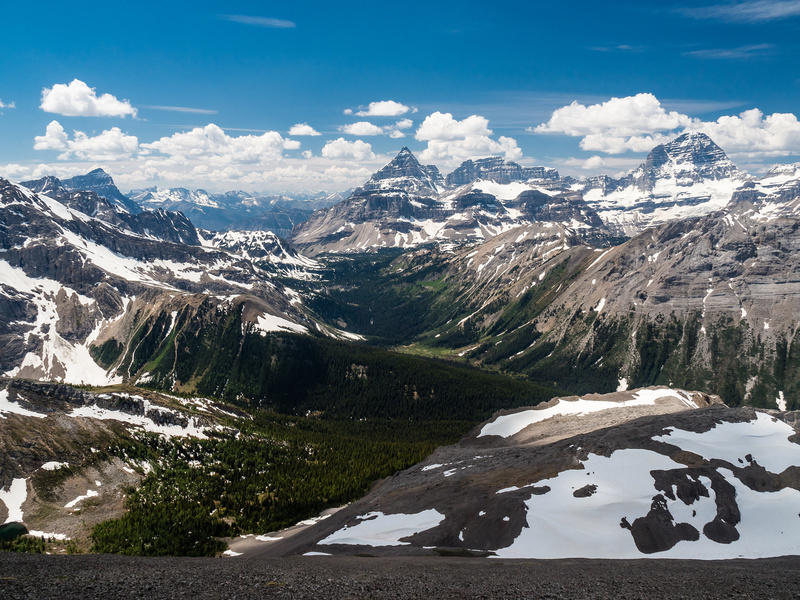 Looking over Bryant Creek to Assiniboine Pass and up the Allenby Pass past Cautley, Allenby and Beersheba (R). 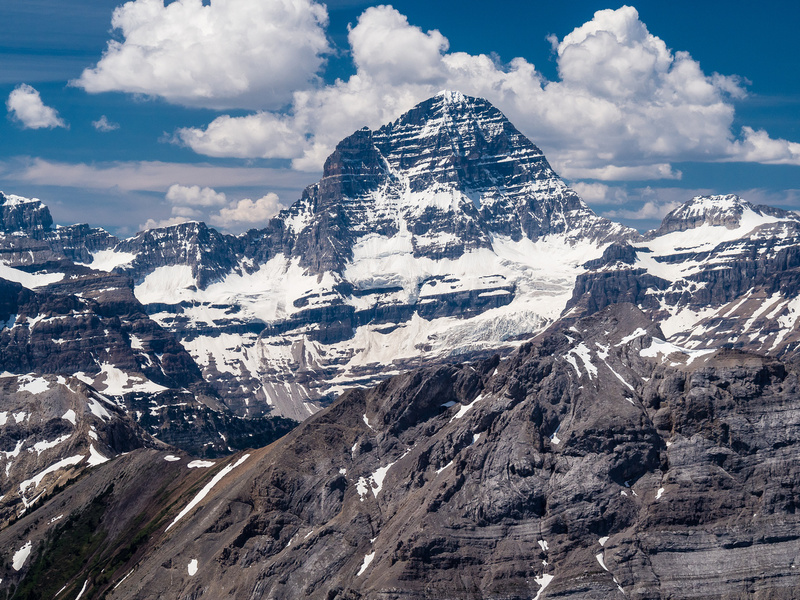 Mount Assiniboine looms over Marvel Peak. 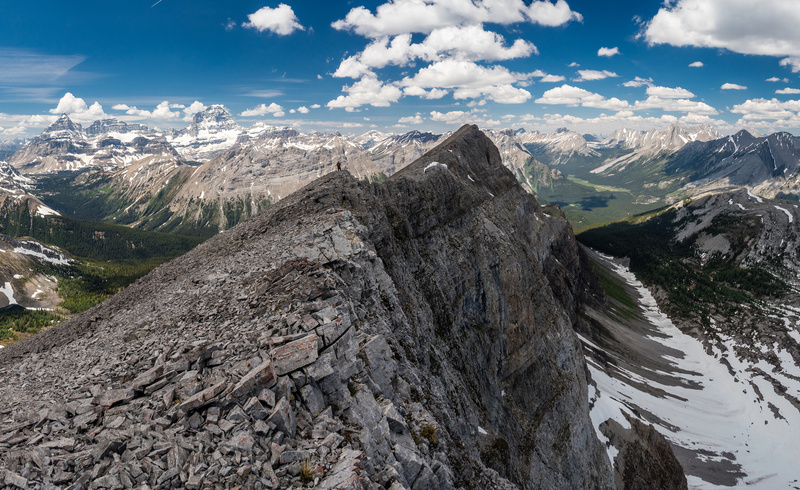 A tele-pano from Morrison (L) to Sir Douglas, Joffre, Warre, Currie, Royal Group and Red Man Mountain (R). 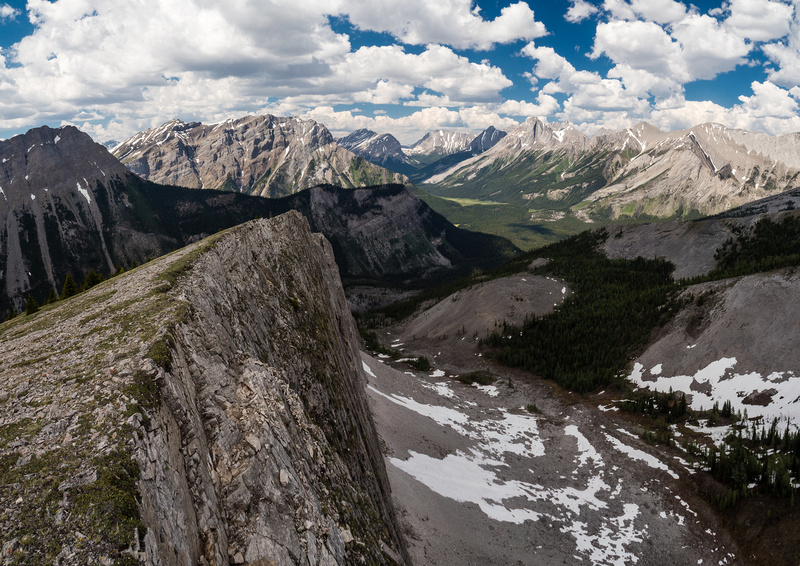 A giant pano looking towards the Spray Lakes (no longer visible) with Turner at left and Assiniboine at right. I was wondering how much bush we’d encounter off the end of Owl Ridge, but here again we got lucky! We found an animal trail leading down the steep nose of the ridge before contouring north into the valley we were looking at from above. From here the terrain opened up nicely and we tramped through mosquito-infested (!!) 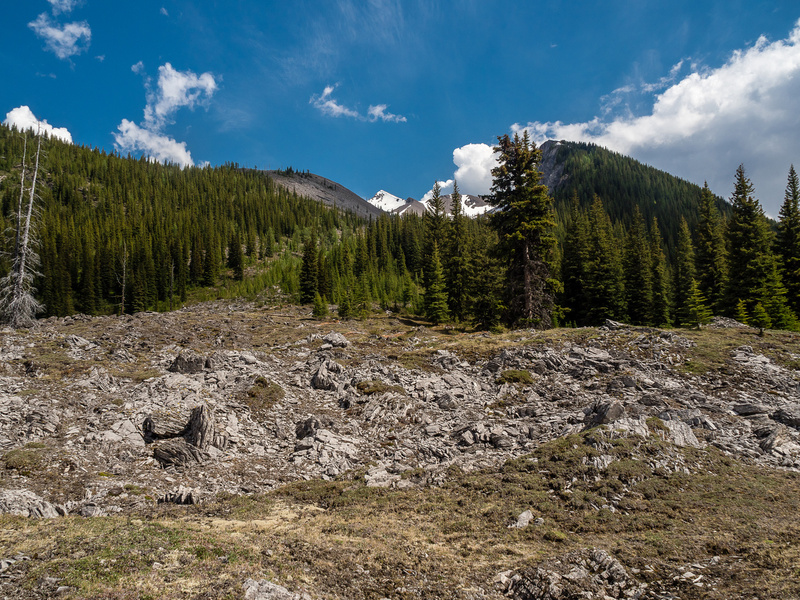 alpine meadows to the Owl Lake trail. 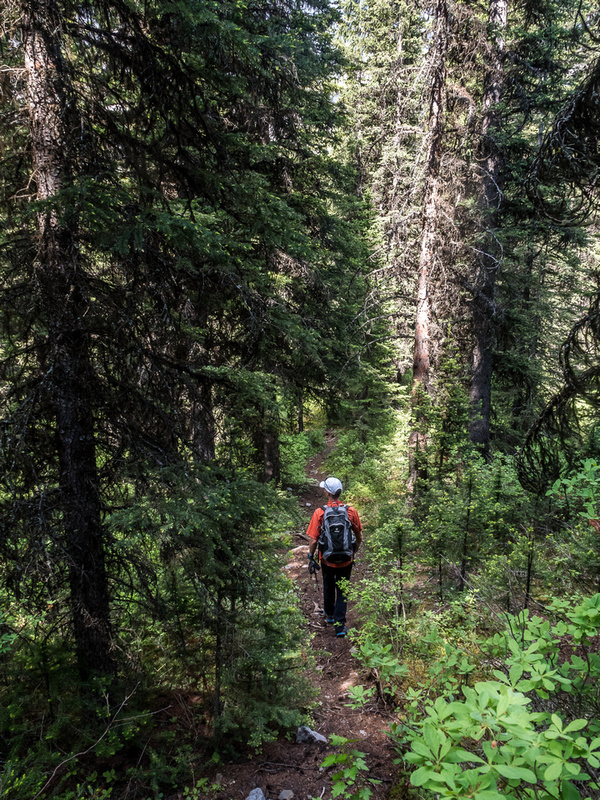 It was nice to hit a good trail for the first time in hours and our pace increased substantially at this point. 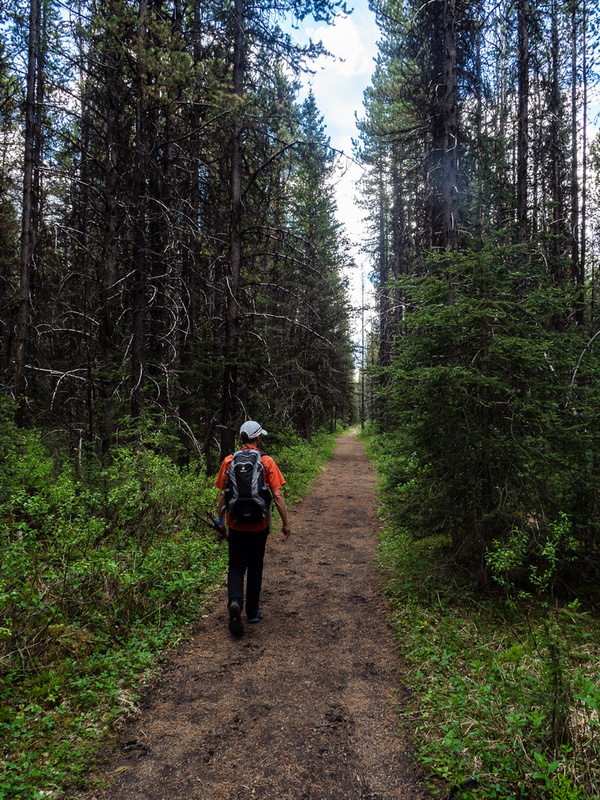 We were starting to realize that our day was going to be a wee bit longer than expected, but the weather was holding and we marched towards Bryant Creek with renewed purpose. It was at this point that I realized I’d left my food bag at the summit of Owl Peak and would be going hungry for the next few hours. 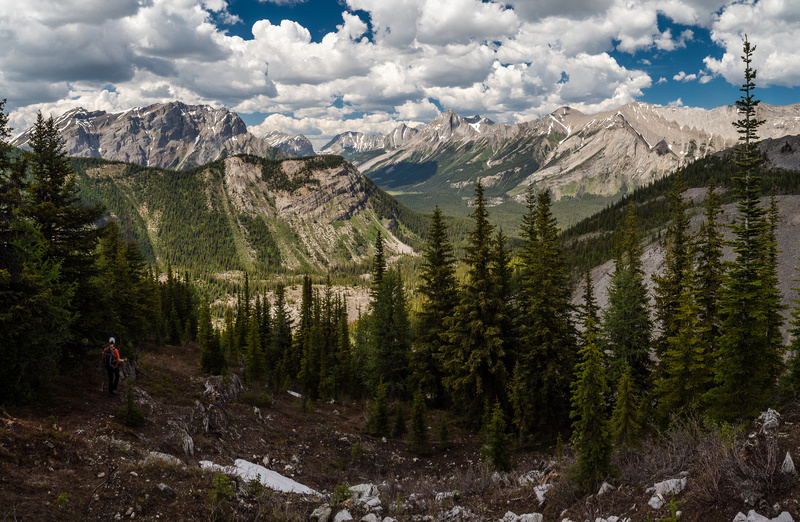 It was tough not to glissade into this lovely hanging valley, but we wanted views of Owl Lake from the ridge running at left to right. 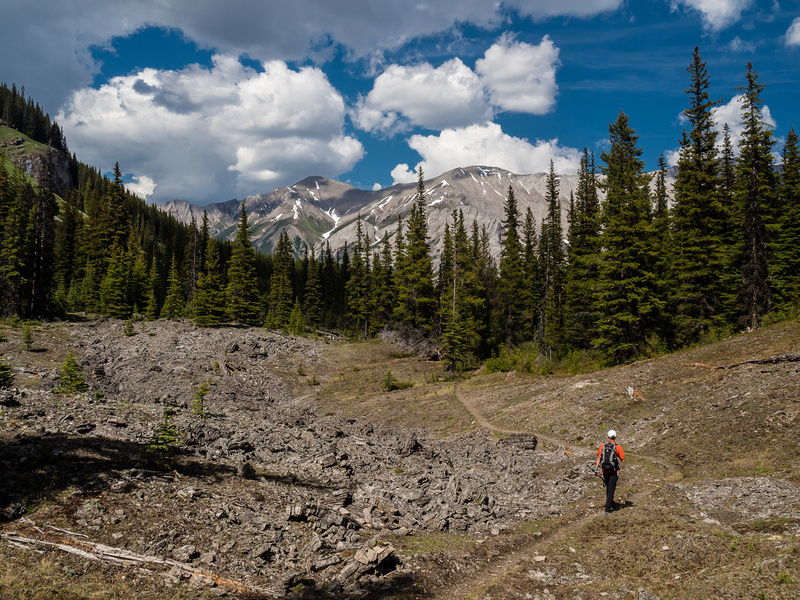 The Owl Lake trail is in excellent condition. 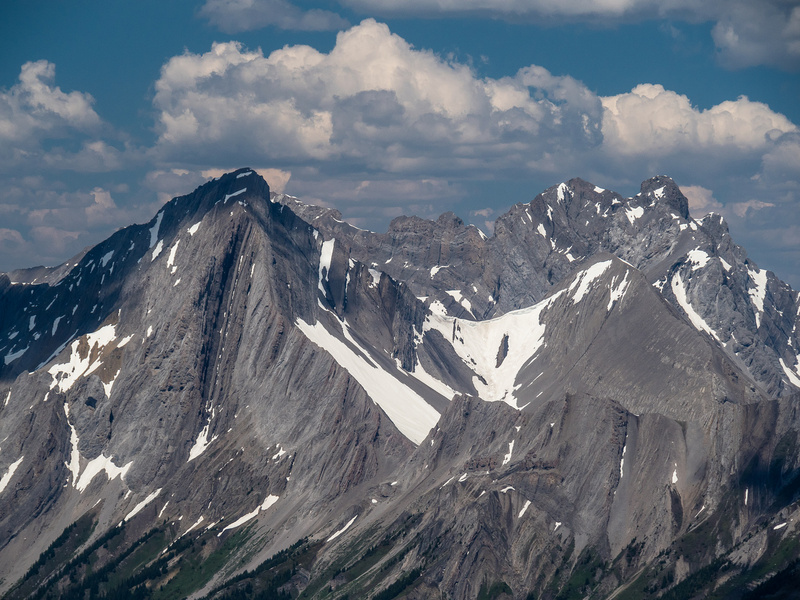 Marvel Peak rises above Owl Lake with Marvel Pass at distant left and Allenby Pass at distant right. I don’t know why HMG makes their stuff sacks gray colored – this is the second one I’ve lost simply because when packing up from the summit it’s very hard to spot the small bag among all the gray uneven rocks. It seemed to take a while but eventually we crossed a raging Bryant Creek and filled our tummies with lots and lots of its refreshing goodness before tramping off down the wide Bryant Creek trail towards our bikes. I thought the ~5km to the bikes went by pretty quickly considering how tired we were already at this point. We were both getting a bit grumpy thinking about the long hill we’d have to soon push our bikes up, but for the most part we were staying pretty positive – it was hard not to on such a perfect day out. Pushing the bikes up the big hill was a bugger, but honestly the ride out was much faster and more refreshing than either of us expected. Bike approaches are like ski approaches – they ROCK on the way back. We pulled up to the truck 11.5 hours after leaving it, with t-storms threatening all around and peals of thunder bouncing off Mount Shark in the distance. All-in-all this is a top 20 and maybe even top 10 scrambling trip for me. 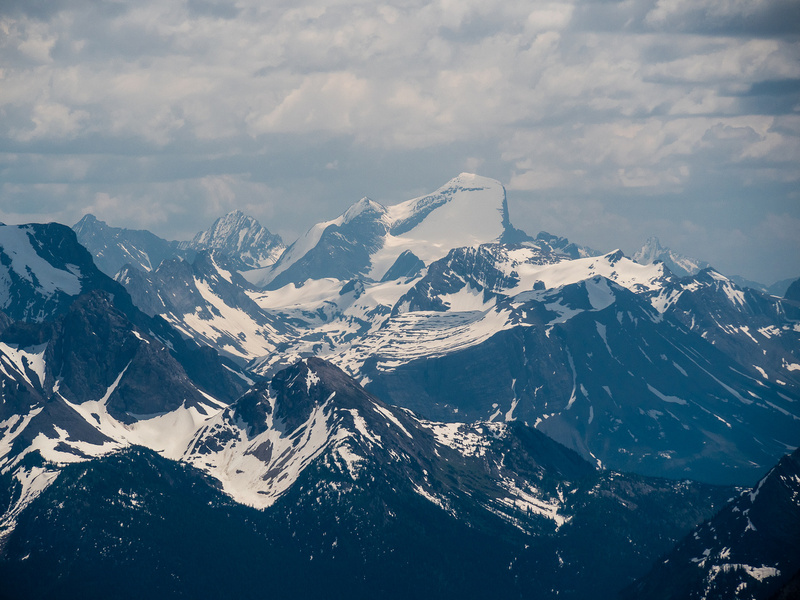 It ticked a lot of boxes such as remoteness, rare ascents, high level traverse in perfect weather and incredible views. 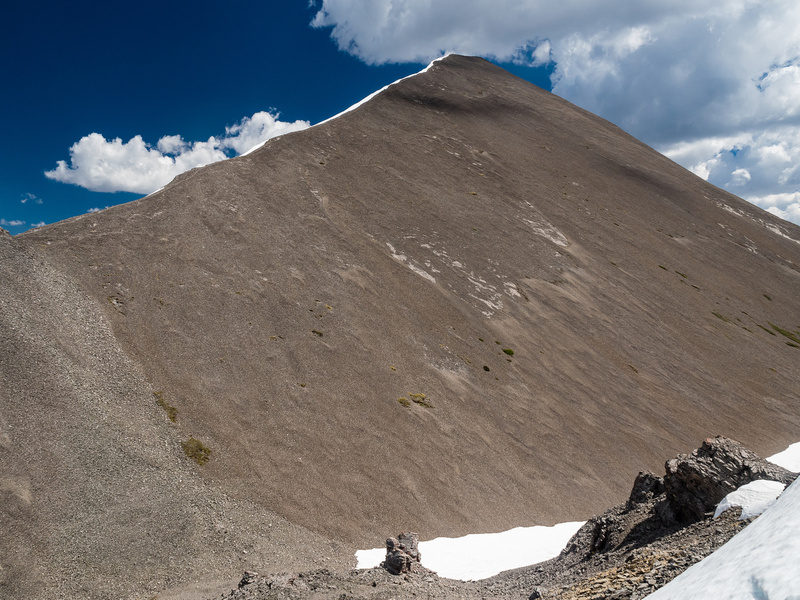 The terrain immediately north of the summit forced us back out onto the west slabs. 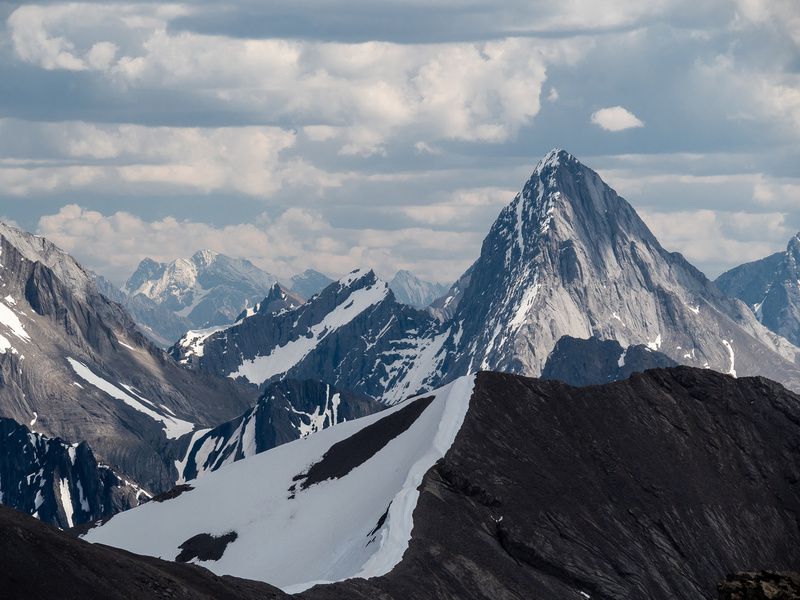 Looking back at the summit of Morrison - the ridge is pretty intimidating! 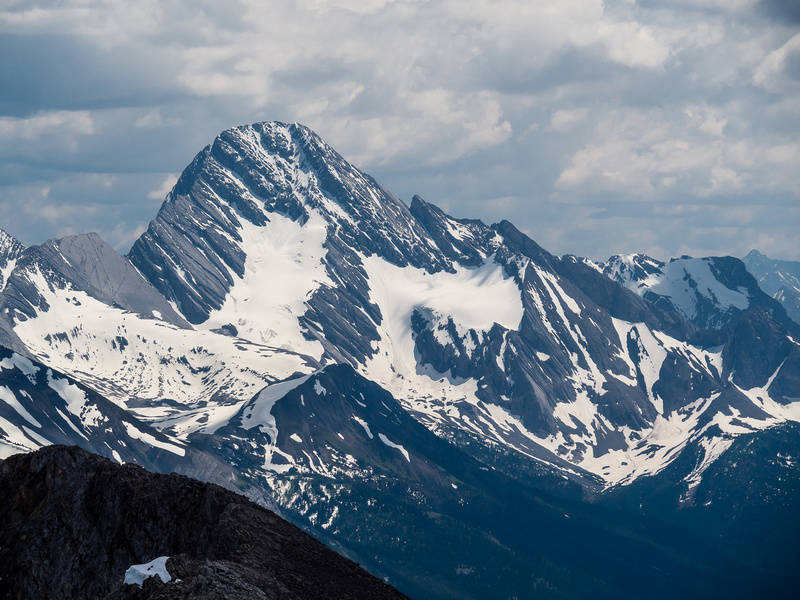 I can't believe I was thinking about doing this peak with Turner, loaded with snow. A nanny goat with her kid. Find the goats (lower left). What a wild scene this was - imagine no wind except for a gentle, cool breeze, exposure and vistas such as this. 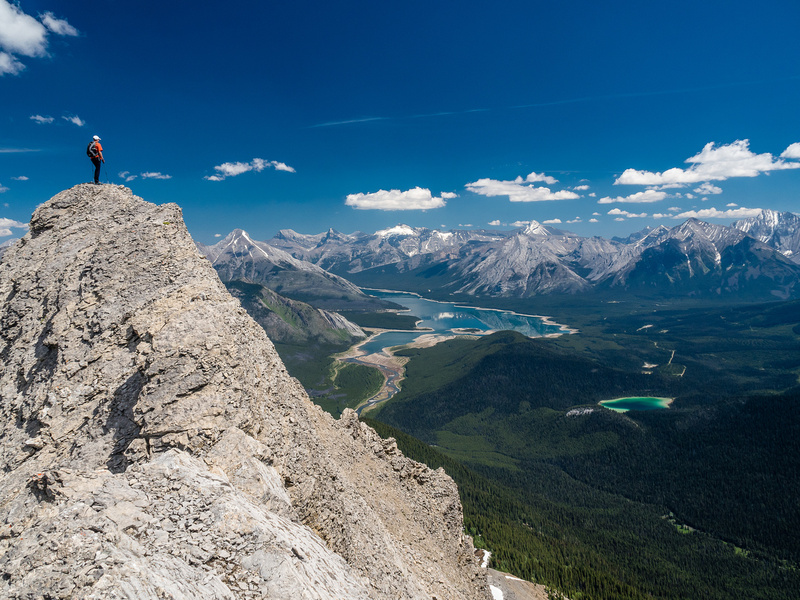 Reaching a high point on the traverse. Phil and our next objective rising in shadow. Note the lower cliff band on the east nose of the peak - this was the crux. Owl Peak finally looks like a proper mountain! The crux is starting to look like a 'crux' too, but it proved much easier than it appears. Mount Turner from just above the crux. Looking back at Morrison (L) and Byng (R). There were a lot of wildflowers along our traverse - even though it's high alpine. Alcantara, Gloria, Eon, Aye, Assiniboine, Marvel, Terrapin, The Towers, Wonder, Cautley and Mercer. Beersheba (R) doesn't look easy. Mount Alcantara looms over the Marvel Pass area. 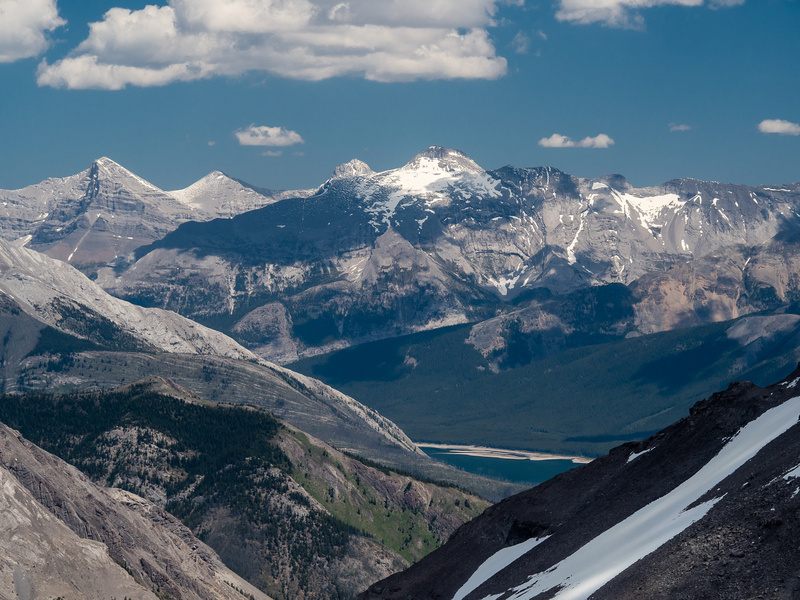 Only a slice of the Spray Lakes can be seen now - Lougheed and Sparrowhawk rising beyond. Mount Sir Douglas brings a smile to my face. What an adventure that peak was! 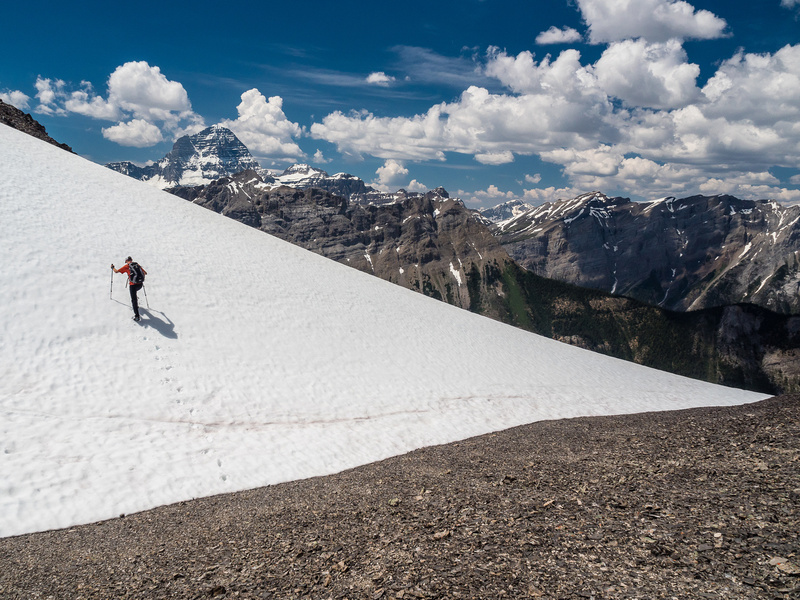 Snowshoeing straight up the face on Joffre was another 11,000er highlight. Leaving the summit of Owl Peak - eventually we'll head lower left. Mind blowing views towards Marvel Pass. Owl Ridge is obvious at lower left with the cliffs lining it. We chose to stick on the ridge crest right to the end rather than descend into the bowl at lower center. 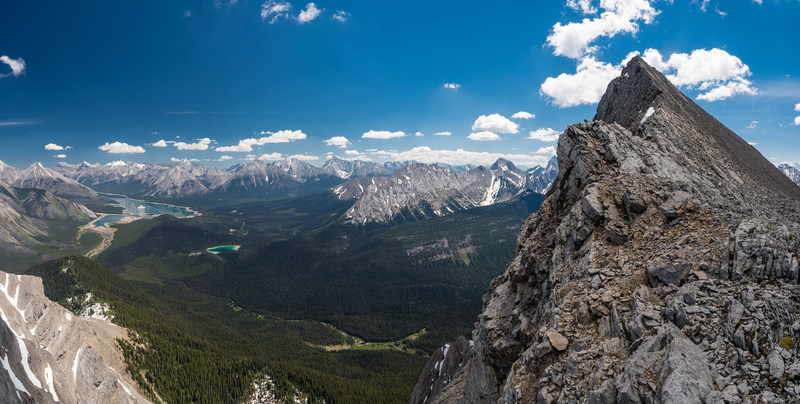 Bypassing a pinnacle on the easy NW ridge of Owl Peak. Reascending from the col between the NW ridge of Owl Peak and the start of Owl Ridge's SE end. Looking back up at Owl Peak. 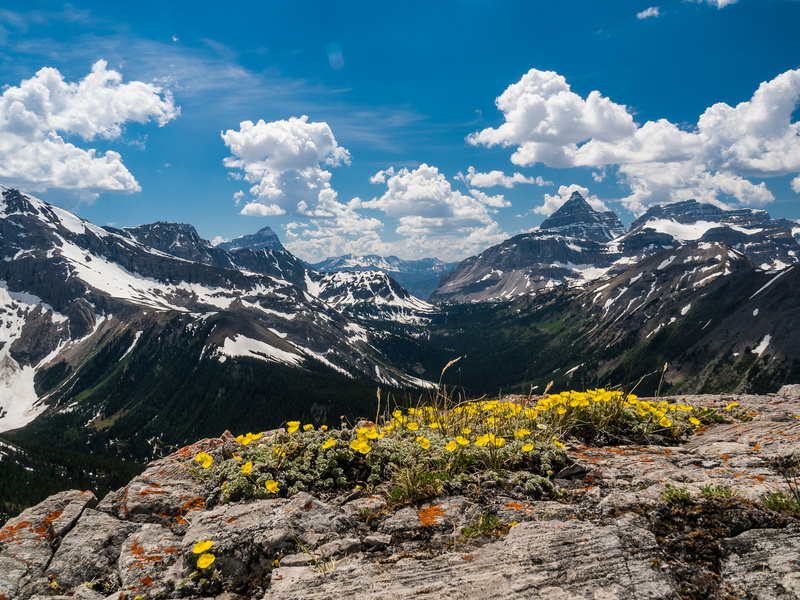 Alpine Cinquefoil and Marvel Pass. Cool views off the ridge over Owl and Bryant Creeks. Looking back along Owl Ridge (R) towards Owl Peak. Mount Turner to the left in the distance. 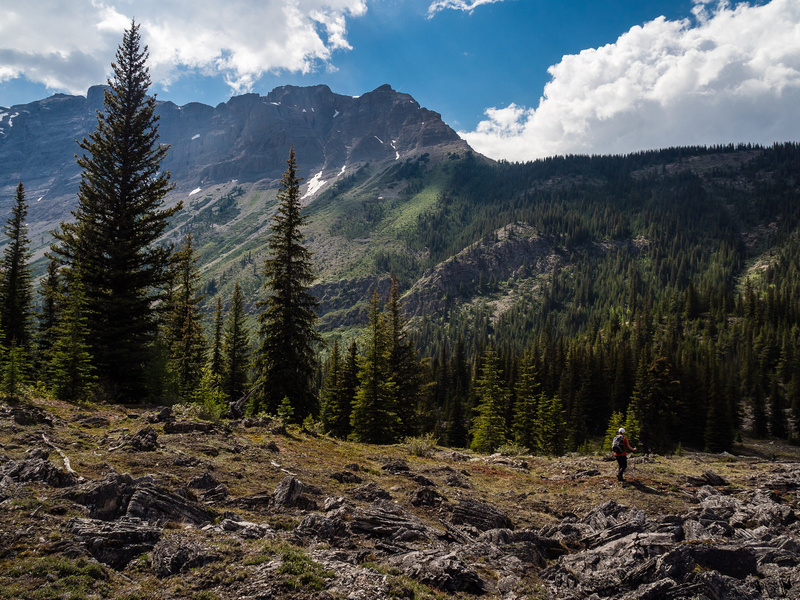 Heading down the nose of Owl Ridge towards Owl Creek. Descending lovely open terrain to the trail. From near the trail, Owl Peak (C) and Ridge are visible. It felt good to be back in the forest but it was muggy and very warm. 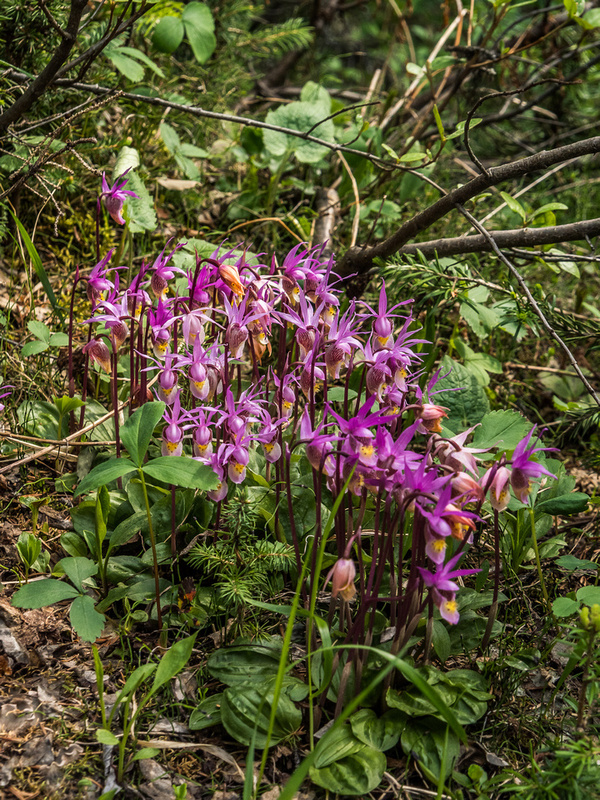 Large clumps of Fairy Slippers along the Bryant Creek trail. Yes. The Bryant Creek trail isn't very dramatic. But it's quick.